Even in first class, it's a pain to get up and get your stitching out of the overhead bin, so I had this design in my purse. It's old and from Shepherd's Bush. The title is Summer Song Sampler. 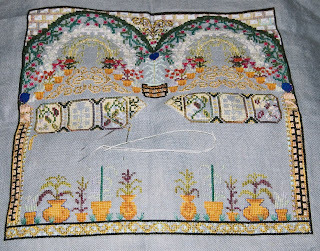 I'm almost done with it and just need to finish the area below the writing and then do the three rows of border. It went really quickly. Now to finish it. For Christmas. My husband framed the Joyeux Noel I did earlier this year. The framing is excellent - he used cherry wood he foraged from a cabinet shop - and I really like it, except it shows up why you don't do traveling threads. There were some popcorn stitches in the middle that I didn't do individually. My mistake now because you can see them through the fabric. I'll be making another one of these for a gift, but I'll make sure and tie off each one of those stitches this time. 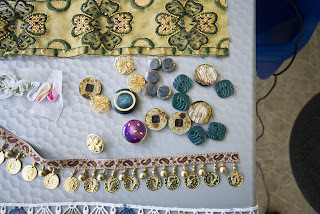 I told y'all last week about Petit Point, the shop I found in Vienna, and the pretty box I bought there. 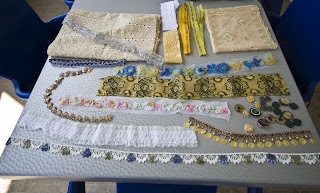 This is the rest of what I got - old berlinwork patterns - five of them! This top one she threw in free for me. It's of the Sandman sprinkling sand to make kids go to sleep. I like it. This one is a simple floral circle. 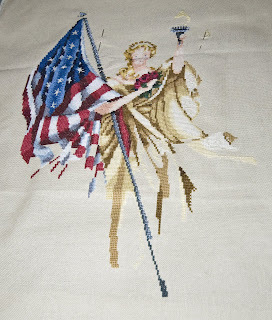 It should be a quick stitch when I get around to doing it. None of the patterns were over ten euros; most of them were seven. I had never seen old ones like these preserved and well used. They're backed with very thick pressed cardboard. Two more floral circles. I'm thinking of framing one or two of these for my loom room. My husband likes the Tyrolean dancers one best. I think it'd be darling on a purse front. I'm back on track with this, and done four days ahead of schedule! Go me! Now if only I could keep up with my other projects as well. You can see it's getting rather leafy. On to part eight on Tuesday. I got yet another blue done - there are five of them, so three done isn't bad. 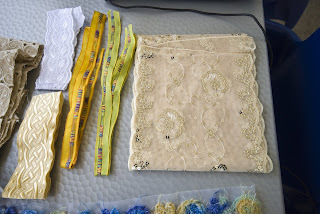 I'm still catching up on things here at home, which means stitching is still sloooow. Puppy keeps getting delayed by the airline - they keep bumping her off the cargo list at the last minute, notifying my companion the evening before he's supposed to drop her off at six in the morning. This has happened -twice- so far. Next scheduled date is Sunday. We'll wait and see. See the pretty bouquet and vase my husband gave me as a homecoming present. See the self-appointed gardener, Tux. He believes flowers are not to be too bushy, so he trims everything with his teeth. This has been a problem for the wisteria growing over the back porch, but he insists. Anyway, I love the hollyhocks, roses and irises. It's a really pretty piece, and the shells underneath remind me of my recent visit to the Adriatic. 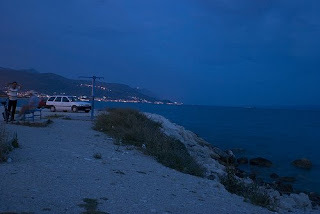 After we left Split, we had to drive home. Considering the roads in Montenegro's interior, it definitely wasn't going to be a one day trip - cutting through Serbia was out of the question. So we decided to spend the night in Podgarica. Big mistake. 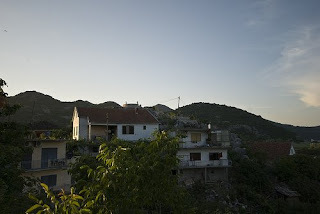 Podgarica, Montenegro's capital, is permanently locked into communist flashback. No hotel that we could find. The place is depressing. It was getting late and we'd already driven quite a ways, so we pulled out the Lonely Planet to find a place to stay. The result: going back over Lake Skadar to Virpazar and entering (weird music here) The Hippie Zone. Virpazar is right next to the lake, a national park that is a wetlands preservation project. 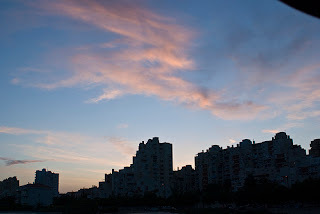 Most of Virpazar's meager income is the result of tourists going out on the lake. This place is at least as poor as many places in Kosovo. 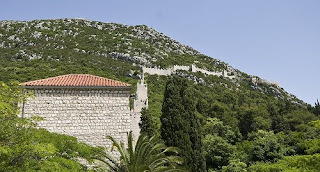 It was built on a medieval fort, and most of the fort is incorporated into people's houses. 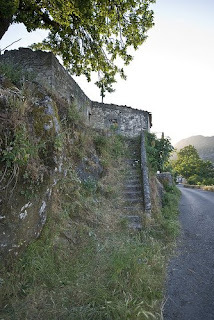 For example, these stairs lead up to a decrepit place that's still used - it has a dog and sheep in the yard and some flowers, but no electricity, no running water, and so on. This is across the street from those stairs. You can see these houses were built shabbily also on fortifications. In the valley below, there's a gypsy camp that's even more pathetic than the houses. Total population of Virpazar can't be more than a couple of thousand people. It did have one advantage over the town on the other side of the lake - no huge dump right next to the road. And now, why I call this The Hippie Zone. The place we stayed was Hotel Pelikan, founded in the Sixties and still stuck there. We ate at the restaurant, which is more what the place is than a hotel (it has four rooms, which are basically bedrooms in the house: ours was across from the family's living room. It was small, spider-filled, and the bathroom floor was always wet from the shower overflow. We were desperate, though. The next nearest place on the way home was through all those tunnels and such, and a ski resort that might not even be open in the summer. So stuck we were. We took a walk around the town (taking all of ten minutes to do so), and went to the restaurant for dinner. It was at least as much of an experience as the room. i was given a wilted bouquet of local wildflowers when we sat down to dinner. With the exception of the frozen mixed veg, it was obvious everything was from the local area. Our first course was mulberries. I don't think I've -ever- been served mulberries before. There was a cold fried dough, some honey, and olives - uncured, new olives. The veal was from an old milch cow from its toughness, but at least it was thoroughly cooked. Someone associated with the place came by with fresh water chestnuts he pressed us to try. By the end of the meal, we had somehow acquired a basil plant on top of that. The only other customers were a foursome of French caravaners who decided to eat out instead of cooking. All in all ... weird and definitely an imitation of an acid trip. I'm participating in the Christmas in July ornament exchange and I got my surprise yesterday. Pascale in Belgium went overboard, and I love every bit of it. Thank you, Pascale. 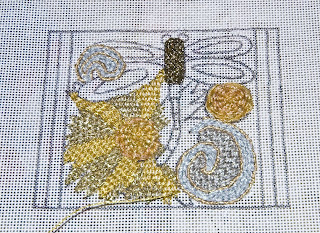 I finished off the berries and added the yellow flower this past week - it's coming along, but I need to get it done in the next two weeks. 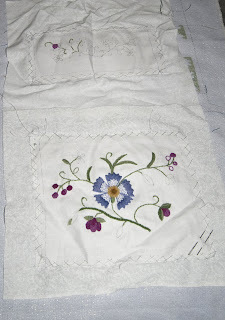 The closed fly stitches made cute little petals, though I think the satin stitches on my berries look somewhat ragged. 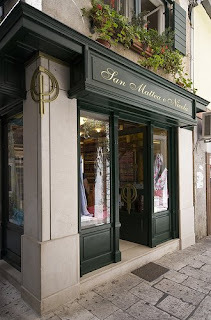 When I was alone in Vienna, I was walking along the main shopping drag and came across a shop named "Petit Point". Naturally, I had to stop in. This is one of two purchases I made there; the other's waiting for another blog post. The thread is DMC, she was working on it in her shop, and we talked about stuff. I gave her the names of several silk floss manufacturers and she was really interested in switching production to silk. She's not the only one who does it. As the work is hand made and well executed, its price is commensurate. She had a lot of lovely purses too, but they were out of my price range. You can tell her attention to detail in how well the inside's finished off. Anyway, if you want to go (she has no website), it's southeast of St. Stephensdom on the main pedestrian street, a couple of blocks down. Yes, I'm still writing about the road trip weeks later - cause I keep getting photos put up and there's much to tell. 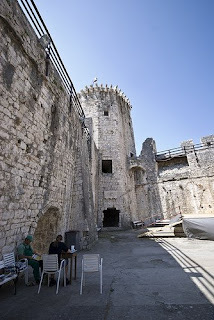 On our last day in Split, we went to Trogir. It's about half an hour north of there and UNESCO has marked it as a World Heritage Site because it's the best-preserved medieval town in central Europe. It's a great little place. The old town is on an island in the middle of the newer parts, and there's not a single modern building in it. This top picture is the former town hall; it's used now as a school. I'd imagine it's hard to study there with the view of the boat basin out all the windows. Here is part of the inside of the "fort" part. We walked the battlements and inside that tower is a great big pigeon den. It stinks, literally. The views from the walls are pretty, though. And this is the landward entrance to town. The walls encompass everything to the water side. Lots of little alleys like this one run in a crooked way throughout the town. It's easy to get lost in them if you don't keep your bearings or don't keep the water in sight. The place was crowded; again, my companion had to wait to get a shot without people in it. 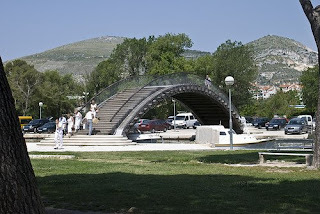 This is the footbridge to one of the newer areas of town. It's just a pretty bridge, so I put it here. There was also a market on the new side and we were lucky enough to see a line of parked classic cars on the quay as we ate lunch. My companion took a lot of pictures of them for my husband. 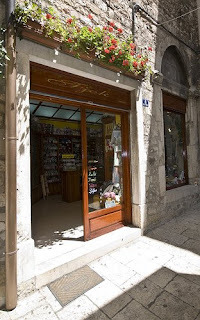 If you want to see more pictures of Trogir, go here. I got part six done just before I went off on my three day airplane odyssey (it wasn't as bad as it sounds). They mailed me part seven, but I haven't started it yet. I probably will in the next day or so. 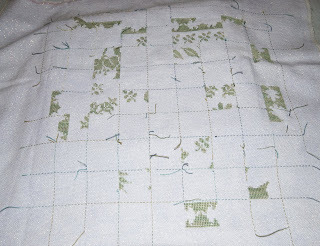 There's definitely an inkling of the overall pattern now, and with all the leaves, I'm glad I picked a green thread. 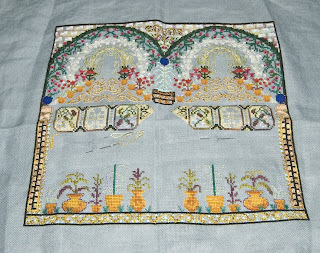 I finished up the bottom flowers on the outer panel and started one on the inner panel, then began the berries. It's coming along pretty well and goes quickly when I work on it ... which will be a lot more now that I'm home. Been working on filling in more green on the plaques. Can't work on it tonight; my bag's checked in all the way to the States and I'm in Paris at a hotel. Tomorrow I'll be home. It seems so long and so short a time simultaneously. I am going to miss there. The beach by the hotel we stayed at is called Znjan. I have no idea how to pronounce it. 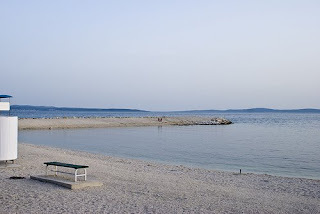 It's a pretty beach with lots of white rocks and views of the islands a few kilometers away. It's also a very popular beach with the locals. most of the pictures my companion took don't have people in them because he really prefers not to take pictures of people without permission. He had to work to crop people out or not get them in the shot. Anyway... it's not because the beach isn't used that it looks empty in my pictures. During the day, people go out to sunbathe and enjoy the cooler breeze at the shore. These people leave between four and six in the afternoon in a process we called "the shift change". For about an hour, the beach is empty-ish, then the families come out to go to the little coffee bars (with playgrounds) and walk up and down the walkway lining the beach. A lot of things go on there - walking dogs, rollerblade lessons for preteens, elderly strolls. It's like half the population comes out before dinner to enjoy the evening. Around sunset, they all start going home and then the fun begins. Living in the Balkans means there's no privacy at home. 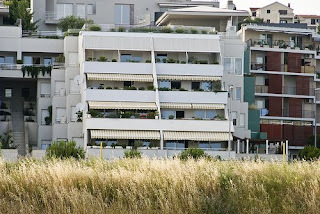 Extended families live together in what we'd call single family dwellings here. So the Kosovars go to hotels to get it. The people of Split head to the beach. Cars cruise up and down it looking for the one thing in demand - empty benches. Benches are about twenty meters apart and provide that little bit of privacy you just can't get at home. Elderly men in groups drinking and talking. Teenagers making out. Older couples getting away from the in laws and kids at home. All come down to the beach after dusk for some time alone and together. We witnessed this every night, and we went down too - but not for privacy. My companion took a lot of photos of the beach at night and I acted as his assistant. Split was the highlight of the road trip for both of us. If you get the chance to go there, grab it with both hands. I've been in a whirlwind the past week preparing to leave and getting everything like museum visiting squared away. 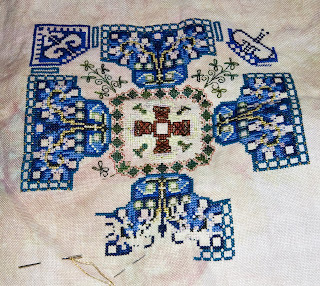 Ergo, not really any progress on stitching. I did manage to add a little more yellow to the flame. Things will calm down for me at the weekend. I started in on part six? last week and got one and a part of a second square done. I'll be finishing this part off today before I leave really early in the morning for Vienna. That way I can start on part seven when I get home, a few days late. I still like the colors. The pictures don't do them justice. The central building in this picture was our hotel. Actually, not all of it was our hotel - only the middle two floors. The rest was private housing. Hotel More was a great place to stay. The picture was taken from the beach, so you can see how close it is! That cross in front of it, the tall metal pole? It's historically significant. It marks the place where Pope John Paul II celebrated mass a decade ago. The cross was part of the elevated altar and everyone was on the beach. The hotel wasn't built at the time. This place takes care of you - they're always concerned that things are right, ask you what kind of food you want for breakfast, loan you silverware for dinner, and give you a table chairs, -and- chaise longues on the veranda. Can you tell I want to go back? 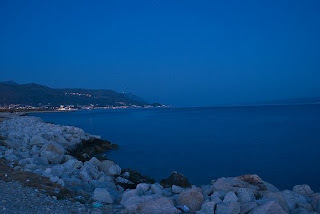 And this is a picture of the beach at night, right across from our hotel. Pretty, isn't it? I'll have more pictures and a story to tell in a post soon. 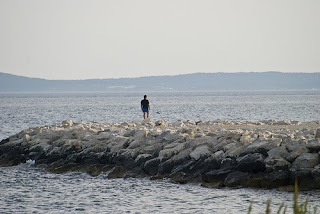 The beaches are used both day and night - there's always someone there. And they're gorgeous. Both of the middle plaques are now ready for their specialty stitches, and most of what is left cross stitch-wise on the plaques is the celadon green background color. Slow progress, but progress all the same. Here she is - my new puppy, Mattie. 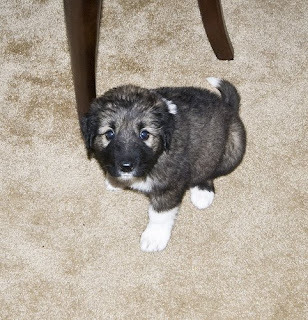 Mattie's a Sharr mix, and only seven or eight weeks old. I got her because someone at the embassy found her beside the road at a customs stop outside Peje. Isn't she cute? She's a sweetheart, too. She's very biddable and obedient and loves people. I leave here on Wednesday; she's flying home on her own on Sunday, since I have two overnight stays. Anyway, that's one reason why I've not been caught up on my stitching. She requires a lot of time to play and also attention to keep her out of things. Another blue done, and this one completely for the corner. I'm feeling kind of bad about my stitching at the moment. I haven't finished a single project on this whole trip and I leave for home on Wednesday morning. On the other hand, I've gotten a LOT done otherwise. Maybe I'll get more stitching done when I get home. Being stopped for road construction is rather normal in Croatia and Montenegro. You have to build it into your transit time when going places. So we thought nothing of it when we were stopped in this rather scenic area (yes, they're all scenic, really) on the way from Dubrovnik to Split and waited for a few minutes. We were about a dozen cars back from the light. Paying more attention to the view down to the sea than the road work going on up the mountain, we were slightly startled to hear a series of booms. Oh! They were blasting a new place to build the road and get another couple of lanes. Great. 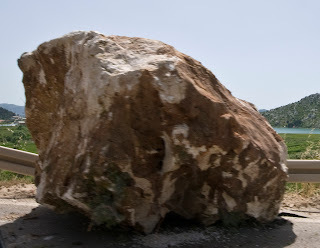 Then... rumble, rumble, bounce, rumble.... one boulder comes crashing down the mountainside. Sure enough, it landed right on the road. We saw it coming down, but my companion didn't react quickly enough to take pictures on the way. It was kind of funny to watch the construction workers afterwards. All of them at the top stood in a line with their hands on their hips, looking down and shaking their heads. In unison. You could tell they were cursing, even from that distance. This poor guy was the flagman below, kicking off the pieces of rock to finish tumbling down into the sea. And this is the boulder in all its glory. Notice the guard rail is -still- intact, and only bent. It gave my companion a lot more confidence in driving on the roads that if something happened, the rail wasn't as flimsy as he thought. On our way back three days later, the boulder had already been removed but the guard rail was still bent. I got the flame started this week and completely finished the blue. 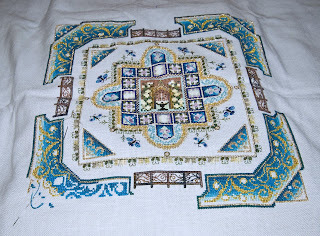 I promise, in a few posts you'll see why I've been so slow stitching! 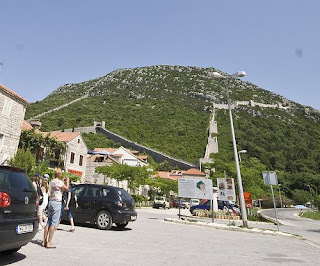 When we were driving from Dubrovnik to Split, we had plenty of time - we ended up with a whole day to do it and it was a three hour drive. Sooo... we saw a sign for a tourist spot called Ston and decided to explore. It's a teeny tiny town on the peninsula west of the coast road an hour or so north of Dubrovnik. For a small spot, there's a lot to see. This top picture is of the salt pans there. It looks kind of like a rice paddy, but they're evaporating sea water to make salt. You can even buy it. The first thing you see on entering Ston is the walls, though. This picture was taken from the back side, where most of the town is. These walls go over the hill and all the way down the other side. Not quite as high as Kotor, but still very impressive. More of the wall here, and you can see the town fort in it, too. We didn't walk up these, either, but you can. 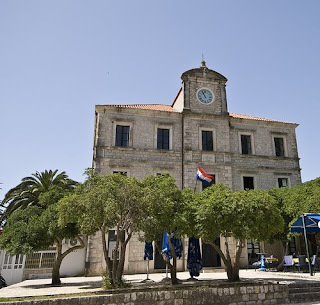 I have a fascination for town clocks, so my companion took this picture of Ston's city hall and clock for me. Really fancy for a town of no more than five hundred people. 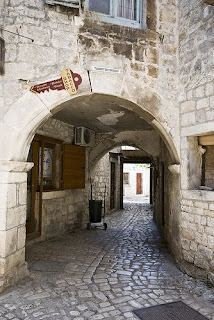 If you want to see more of Ston, you can go here and click on the Ston set. I got a couple more petals done this week. After I get home next week, I'll get lots more stitching done. Maybe. Someone's asked me to marble papers and dye fabric to sell on etsy. I'm thinking about it. I'll at least do some and see how they go. The lack of lines is really telling in this area, and I hope I can finish this sunflower so it looks decent. 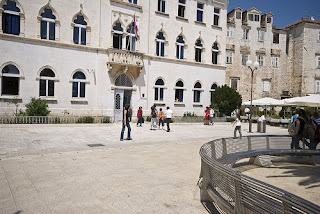 These few pictures are of Split's old town. 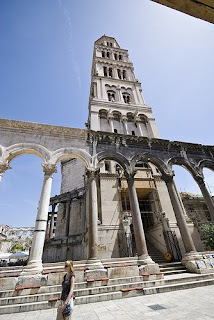 The place is weird because it's built of the palace of the Roman emperor Diocletian (end of the third century AD). The roads are the palace's corridors, and the buildings, former rooms. This top picture is an example. The columns are part of the old palace and the cathedral was built inside. Kind of neat looking. 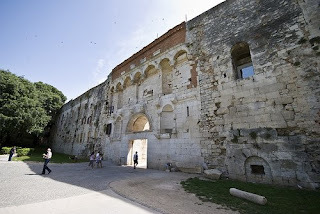 This is a picture of the north gate. You can tell it looks a lot more like a single building here than a bunch that are protected by a wall. And this is a picture from the harbor, on the south side. 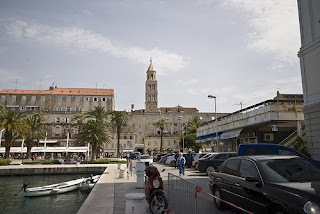 Unlike the harbor for Dubrovnik's old town, this harbor is much more a working one. The ferries depart from this area, and they're constantly coming and going. I have fallen sooo far behind on stitching on this trip, between the road trip to Croatia and something else that you'll hear about in a post in the near future. Some progress on Tuscany, though. 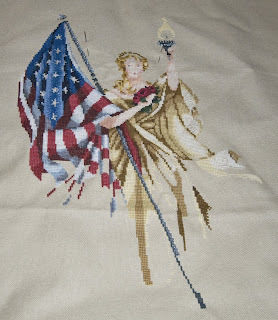 I added more color to it and am about halfway done on this fourth section of part three. Once I'm done with it, I'll start in again on part two and finish it off. This is obviously going to be a very looong project. 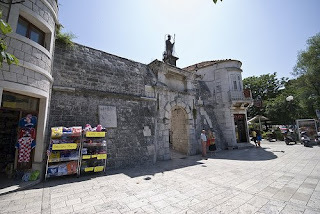 While in the old town of Split, which is also Diocletian's palace, I found three! shops. Two were trim shops and one was a fabric shop. I helped the daily receipts of all three. 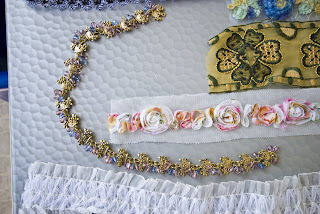 This top shop shows some cute ribbons and a wide piece of lace I found. 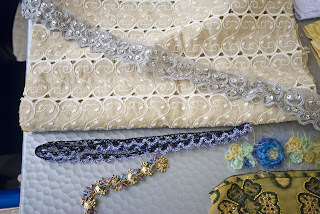 More trims here and the only piece of fabric I bought at the fabric shop. Fabric was top quality, but I really don't like paying nearly a hundred euros per meter for stuff I could get in the states for about thirty dollars a yard, especially since I can dye my oen silk. 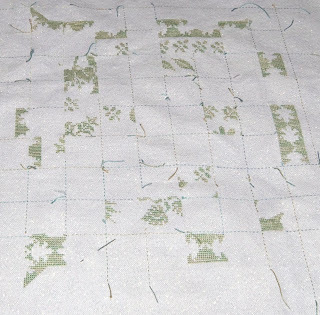 So I bought this piece of linen, which I found really interesting. Now to figure out what to do with it. The metal trim snaking across this picture is heavy and was expensive, but I really like it. It's made up of basket charms and Swarovski crystals. It'd make a good bracelet with some left over, but I have other plans. The ribbon on netting will do well on some projects, too. Both of the trim shops had a wide selection of very nice buttons. Several were dichroic, even. I bought a bunch and also this neat little coin trim, where it's all old Roman reproductions in tin. And here is all the stash I bought, laid out together. It looks like a lot when it's all spread across the table. This shop was off by itself down one of the streets running down to the harbor. And this was one of the trim shops. It was directly across from the expensive fabric shop shown below. Very nice people in all three places, and willing to help.